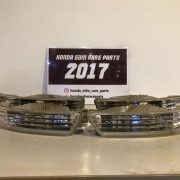 For Sale Edm Glass Headlights from a LHD EG Civic. We are selling a Set of Edm Glass Eg 91-95 Headlights from a european Eg6. Both headlights are removed from a Left handed Drive Eg Civic 1994. The headlights are power adjustable. Comes like the pictures shows so also with the pigtails and the height adjuster Switch. H4 bulbs can be fitted in the headlights. Good used condition, the glass lenses have no large stone chips or cracks. Only the tabs has some drills holes. The corner light has one small crack on the mounting point. 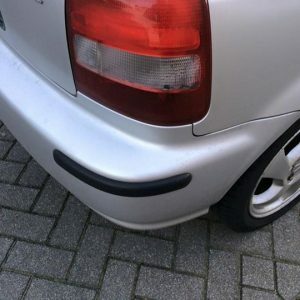 There could be some small marks and because of the age you can’t expect a new parts. It is still a used part. But there aren’t broken tabs otherwise we will show on the picture or describe it. 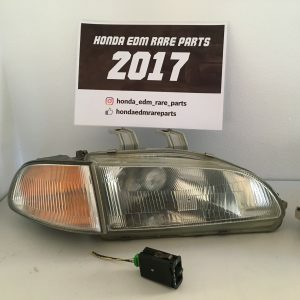 The headlights fits on the Honda Civic Eg from the year 1991 till 1995 and maybe some 1996 over year models. It doesn’t matter what kind of model you drive it fits on the Hatchback, Sedan and Coupe. Some cars don’t have the standard wiring for the Power adjusters. So custom wiring is needed to make the Height power adjuster work.